NPCs, Non-Player Characters, are the principle sources of information about the game's lore. They are also the usual sources for quests and quest rewards, and the NPC merchants are invaluable for equipping your hero for battle. NPCs will play their familiar role in Diablo 3; giving quests, telling the game story, and sometimes assisting characters in battle. Not much has been seen of NPCs thus far; there were no towns or merchant NPCs in the Blizzcon demos in 2008 or 2009, and the few NPCs found in the field were simply there as part of quest dialogues. Planet Diablo:Can you tell us about the role of NPCs -- How big a role will they play in Diablo III? In Diablo II , sort of going along with that, they didn't move that much, they stayed in their general area of within their town; are they going to be more mobile in the game? Julian: I'm gonna say yes, absolutely. Without giving you any details with exactly how, where, and why because it starts to reveal too much story, the intent there is, and in all ways really, the intent is to make the world seem more like an actual living, breathing world. This is why we have you interacting with the backgrounds as much as we do, this is why we're making the NPCs really play a bigger part in the story itself, and part of that will be getting more direct and active involvement with, you know, the NPCs themselves and having them move around and do things and see them doing the things that happen in the real world, not just hearing about it through dialogue. Early concept for NPC dialogue; now removed. The Barbarian speaks with Deckard Cain. 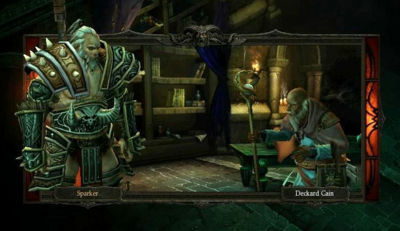 NPC conversations in Diablo III are shown in the normal game screen. The camera merely zooms in a bit, while maintaining the same overhead view. The conversation is ended and the screen returns to normal if you click anywhere outside of the dialogue tree, or press the space bar or Esc key. When the game debuted at the WWI event in June 2008, NPC conversations were portrayed in a special pop up window display which you can see below. This approach was abandoned between the June premiere and BlizzCon in October, since the D3 Team felt that it took players out of the flow of the game. The following NPCs are confirmed to appear in Diablo III. They are covered on individual article pages; click through to learn more about them. Also see the NPC category for a complete list of NPCs, both confirmed and speculated. The following are likely to be NPCs, but have not yet been seen in the game. An official still image from the cinematic trailer. Leah was mentioned by name in the WWI 2008 gameplay trailer, but was not seen in the BlizzCon 2008 demo. From what the Barbarian says in the WWI gameplay movie, Leah is an NPC who is Cain's assistant, who tells the hero that he (Cain) is missing in the Monastery, and must be rescued. Could Leah be Pablo DeSoto's daughter? The location seems wrong; she's in Tristram with Cain in the teaser cinematic and apparently in the quest as demonstrated in the WWI gameplay movie, but the journal entry might be outdated, or be information from before the game begins; perhaps demons entirely overran the village of Wortham, and Leah and Pablo de Soto were forced to flee to Tristram? Concept art of Pablo DeSoto. Pablo DeSoto is seen in detailed concept art, and mentioned in the Gnarled Walkers lore entry, as quoted above. He is said to be knowledgeable of magic and mentioned to have some sort of grudge against necromancers. This might be a flashback or homage to Gheed, the Necromancer-hating NPC merchant from Act One of Diablo II. Concept art seen at BlizzCon. 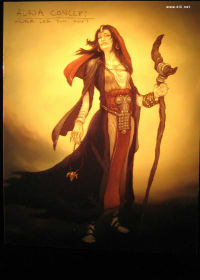 Adria, the witch from Diablo 1, is mentioned in Deckard Cain's journal, and was seen in concept art in the Blizzard Museum at Blizzcon 2008. Not everything in concept art makes it into the final game, but with a lot of returning elements from the story of D1 in D3, and much of the early action taking place in and around Tristram, a return of Adria seems like a safe bet. It is indicated that multiple characters from previous games are returning. Jay Wilson says in an interview that they're "bringing back a lot of characters from the previous games." This is elaborated on another interview in which he says that "people can expect to see characters from Diablo I, more characters from Diablo II, and characters from some of the books. We're definitely going to bring a few of them in." Abd al-Hazir - Travelling scribe, documenting lore. Franklin Burroughs - He's a Dune Thresher-hunter. This page was last edited on 25 October 2013, at 19:43.